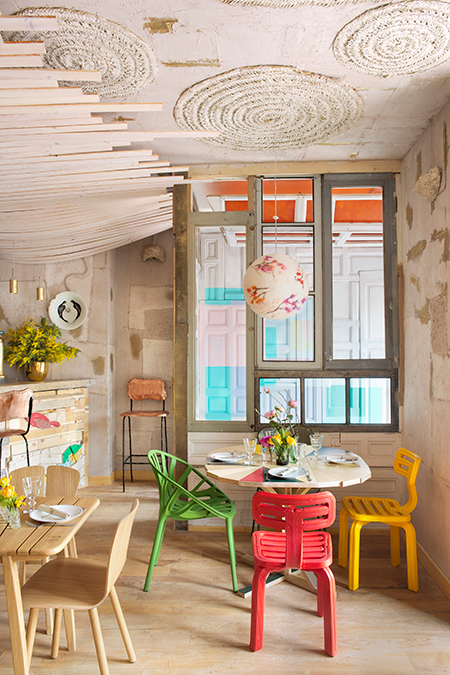 Recently I had the pleasure of connecting with Manolo Yllera, a Madrid-based interior designer and photographer whose beautiful studio loft home features in my upcoming book (more info on that soon!). Manolo introduced me to his award-winning interior design project at Mama Campo restaurant, which showcases works by 47 different designers. With so much going on, you would think it would feel less restaurant more art gallery, but somehow everything magically hangs together beautifully, creating a very cool ambience. 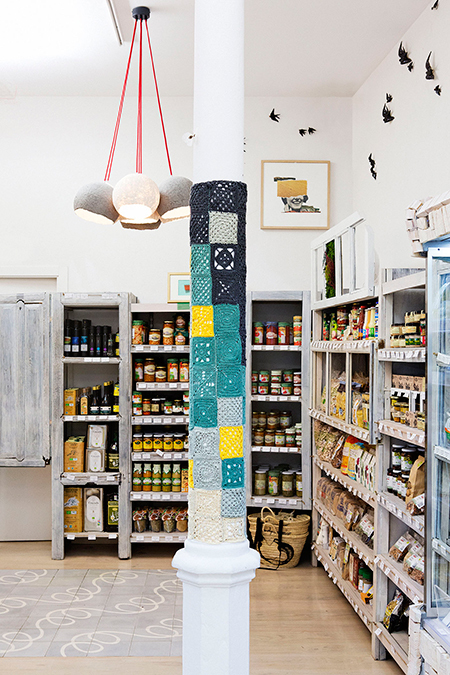 Mamo Campo comprises a restaurant, grocery store and canteen, located in the heart of Madrid on Plaza de Olavide. 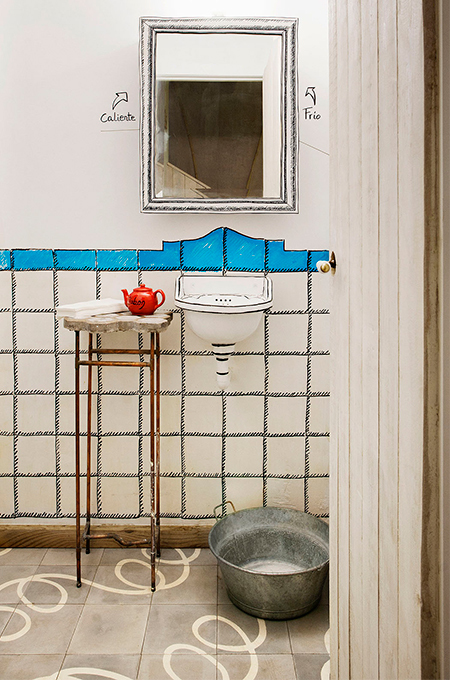 All three spaces are brimming with interesting designs that extend from the bar to the bathrooms, some by lesser known designers and others by household names such as Tom Dixon and Marteen Baas. 35 of the designers are Spanish and 12 pieces were specially commissioned and made from recycled materials. 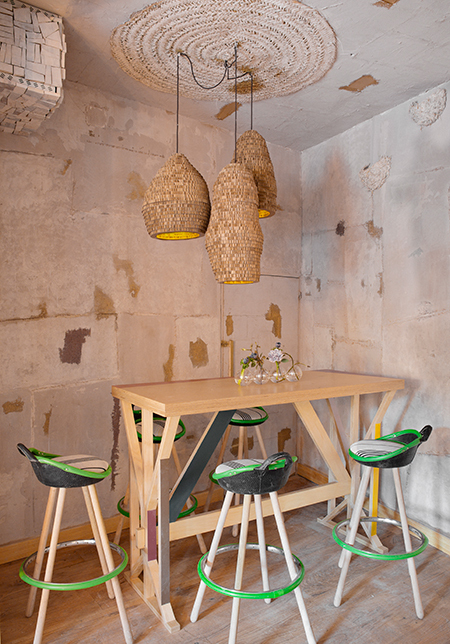 Above shows recycled chairs by Po-Paris and pendant lights made from scrap wood by Artilujos. 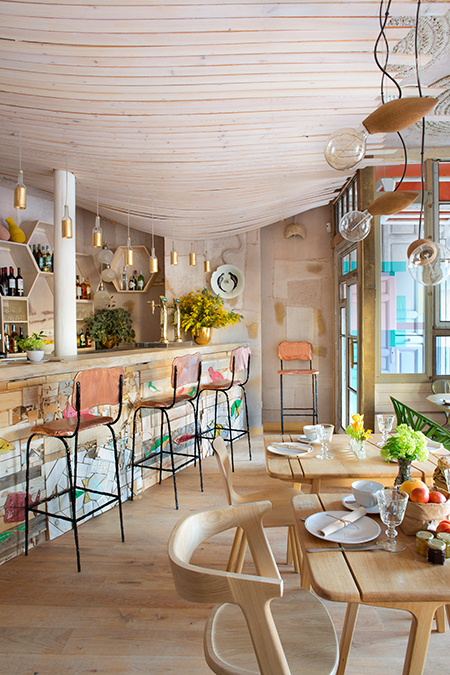 The bar was created by Manolo Yllera and La Casita de Margaux and is covered in a vibrant mix of patchworked reclaimed materials. What appears to be a warping ceiling that hangs over the bar area, is an innovative design by a collective called Qatay. 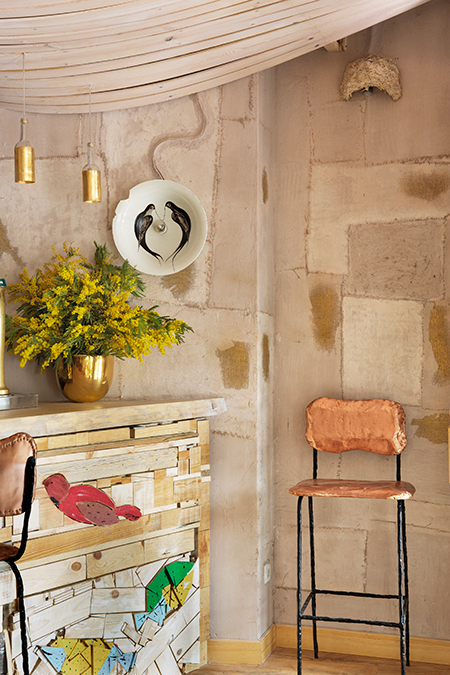 They continue their textured theme on the walls throughout, which are covered in gold linen and sand. The interior is unified with a palette of neutrals, metallics and natural wood. The wall lamp is illustrated by artist Carlos Villoslada. Gold pendant lights that hang over the bar are made from recycled glass bottles and the bar stools are made from recycled bronze by Inés Benavides. 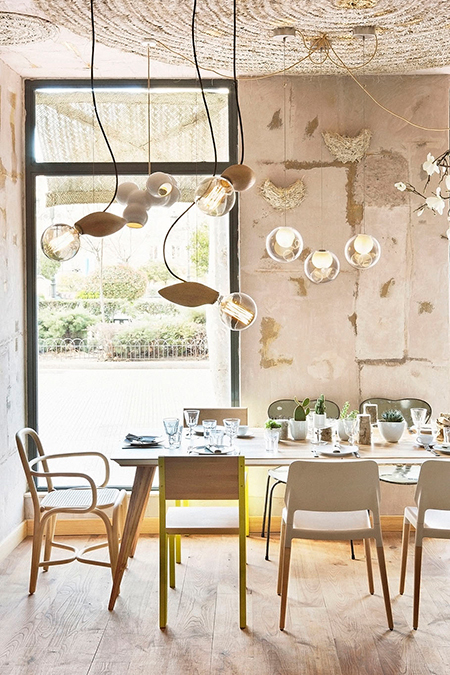 The showcase of statement lighting continues with wasp-shaped Swarm lights designed by Sweden-based Jangir Maddadi, ceramic pendant lights by Maerre Morel and Omer Arbel lamps for Bocci. 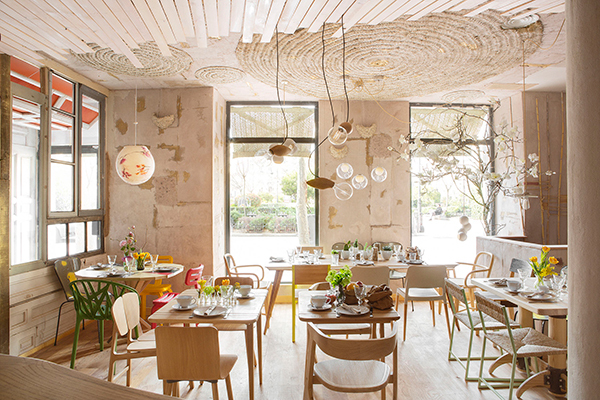 The ceiling designs were achieved with eco-friendly materials such as earth plaster, jute and clay paints. 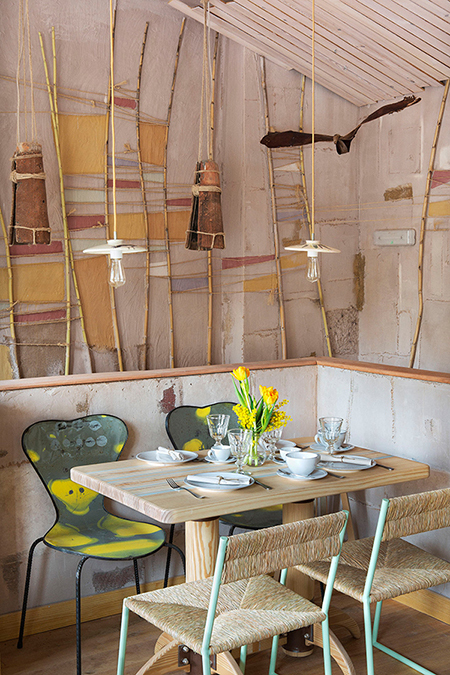 The restaurant features a wall of upcycled windows. The iconic Chubby chairs are made from reclaimed synthetics by Dirk Vander Kooij and punctuate the interior scheme with bold colour. I love the round floral Woolight pendant by Txula made from handmade felted wool. 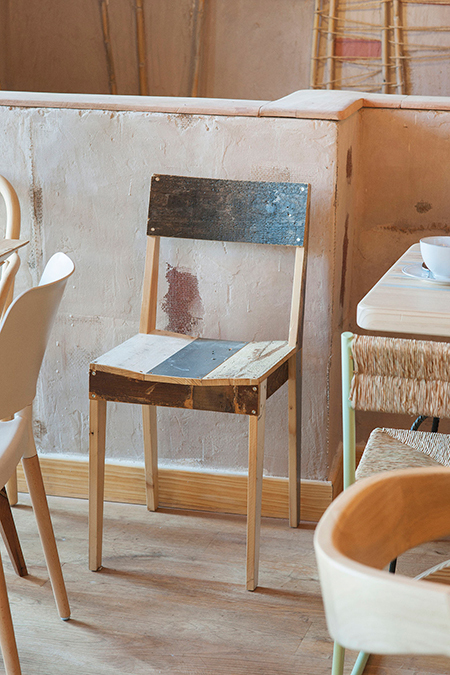 Chair made from scrap wood by Dutch designer Piet Hein Eek. Recycled lamp by Enrique Romero de la Lana and commissioned wool art piece by Lana Connection. and Bee Hive lamps made from recyclable Re-board by Marc Krusin. It’s no surprise this project won Best Restaurant Design in Spain 2014 and was also a finalist in the Bar & Restaurant Design Awards. 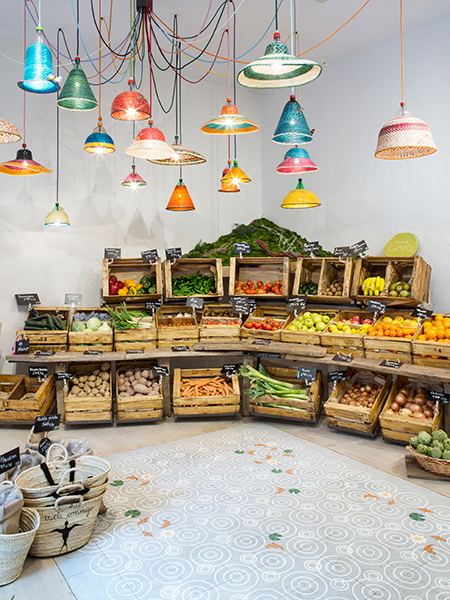 But if the fabulous ambience of Mama Campo’s interior isn’t enough to convince you to a book a table next time you’re in Madrid, check out the delicious organic food on their Instagram page – evidently not just a feast for the eyes! Indeed, there is no limit with our imagination. Just as long as you know how to be creative, and think outside the box. 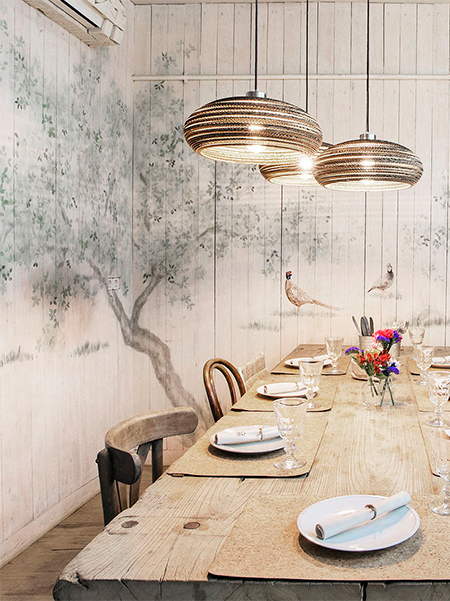 This restaurant is just one of the best examples that you can take. Love this! I’ve just recently finished my own up cycle project… I work with skirting boards and have repurposed some scrap pieces to make a picture frame.